The pattern on this comforter is perfect for rustic guest bedroom. The comforter is excellent quality! We have washed it multiple times & it shows no sign of wear. It is quite heavy & possibly too hot for summer, but we've gotten a lot of compliments from our guests who use it! This comforter fits my king size bed perfectly. The colors are just as pictured, bold yet elegant with its pattern and shades of browns and greys. It is thick and soft. 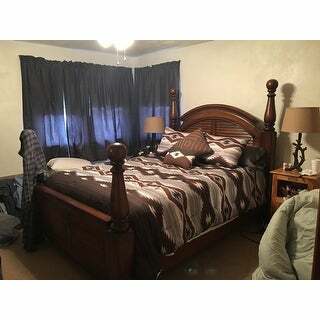 My husband loved his room after decorating with this comforter set. Very easy care. Beautiful comforter set. It is light and not too heavy, but still warm. very breathable material if you usually get hot while sleeping. Love all of the pillows too. looks beautiful against my light brown walls with dark pine floors. I accented my décor with grey to bring the grey out for more color. looks western but not too much, I have it in the masterbedroom and am very pleased with the fit and quality. we do sleep under it on very cold nights very warm. Live this set and the colors! Very soft and comfortable. I absolutely love my comforter set. It looks exactly as the picture and is even fuller than I expected. Holds heat in so well and is so comfortable. I would recommend it to anyone. Perfect! Durable and of much higher quality than I anticipated! I'm really enjoying it! The colors match exactly what's in the photograph and blended well with my decor! I love this comforter. The colors are gorgeous and exactly as pictured. This set is beautiful and very warm. If you're cold while sleeping, then this is the set for you! I received this comforter set in the wrong size, my fault. I had to send it back and have not reordered, however, this set was gorgeous. Looked just as pictured, even better in person. I will probably reorder this in the correct size later as I really did love it. Great quality. Looks just like the picture. Amazing! Great quality, super soft. It is just like the picture. Really like it! "What is the weight of this king size comforter?" "Can I get matching curtains "